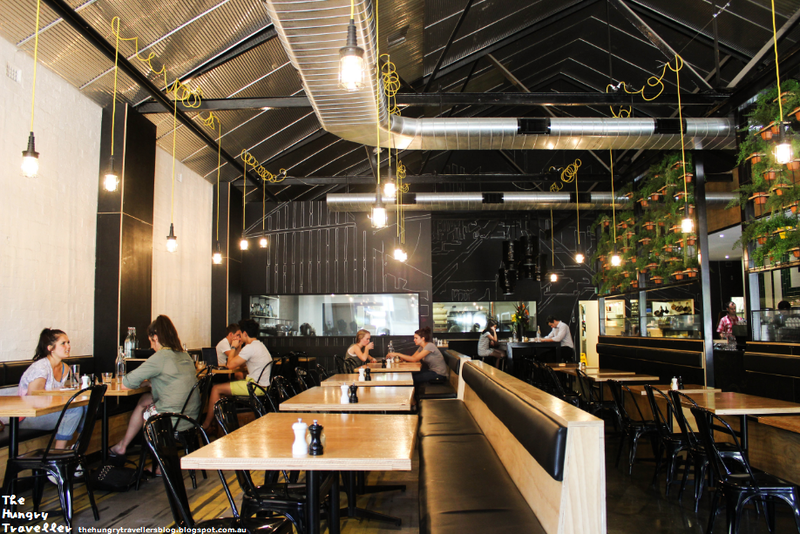 Axil Coffee Roasters sits on Burwood Road, just round the corner from Glenferrie station. It's easy to find and definately easy to get to. On my first visit, I was suprised to see that the cafe was so spacious. I guess I'm just so use to the little joints in the city where you have to cram up close to neighbouring tables. But it was nice to have some breathing room here. 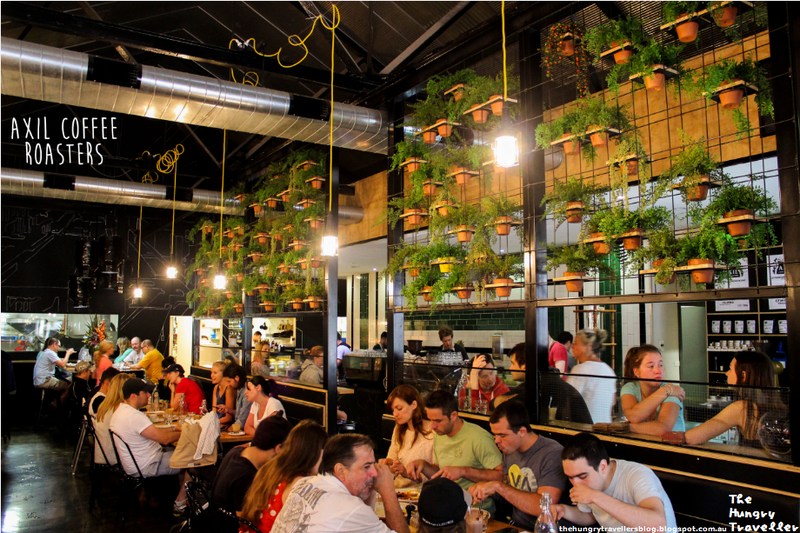 I also really liked the plants and the lights in the cafe. The staff serving us were really nice and friendly, espeically the girl who asked how my New Years was. They seemed geniuninely happy despite having to pull a 7am New Year's day shift. But onto the food - What did we eat? I knew I wanted the corn and haloumi fritters as soon as I saw the menu. (I'm currently going through a haloumi stage, you see.) I'd also seen the dish on Urbanspoon before, so I knew it was one of the more popular plates at Axil. It arrived, after a short wait, in a wonderful pyramid of colour. The egg was poached perfectly, with delicious golden yolk that flowed onto my avacado.The fritters were crisp, warm and full of sweet, sweet corn, but I found it a little bit disappointing in the haloumi department - I couldn't really distinguish the haloumi in the fritters, except that it was crumbly the way haloumi is as a cheese. I loved the tangy, spicy salsa and avacado, but wasn't so sure about the spinach. I think salmon might have gone better with the dish, especially with the salsa. Nonethless, it was a very satisfactory first brunch of the year. My sister, A, went for the NY Big Breakfast. I confess to not remembering much about her dish, I didn't end up taking a photo either because she was really hungry, so I didn't want her to wait for me to examine it in my foodie way. But I did try a little bit of her mushrooms, toast and relish and they were lovely and flavoursome. My second visit was on my birthday. My friend and I were in the neighbourhood, so we decided to go for a sweet, late breakfast. We was met with friendly staff again. It was much quieter on this visit as it was a Monday afternoon so we could pick our own seats. I ordered a sweet dish this time: Red velvet pancakes with black seasame ice-cream, raspberries and cream cheese ganache. I loved the black seasame ice-cream, raspberries and cream cheese ganache. The tartness of the raspberries really balanced out the sweetness of the dish. The red velvet pancakes were interesting - they were quite rich though. I thought they had a strong 'chocolate or cocoa' taste rather than than a 'red velvet cake' taste. I also thought the pancakes were crumblier than what I'm use to. But I liked the beautiful colours on the plate. If you have a sweet tooth, this is an original dessert dish worth trying out. I didn't end up trying a coffee here, the the first time or the second. 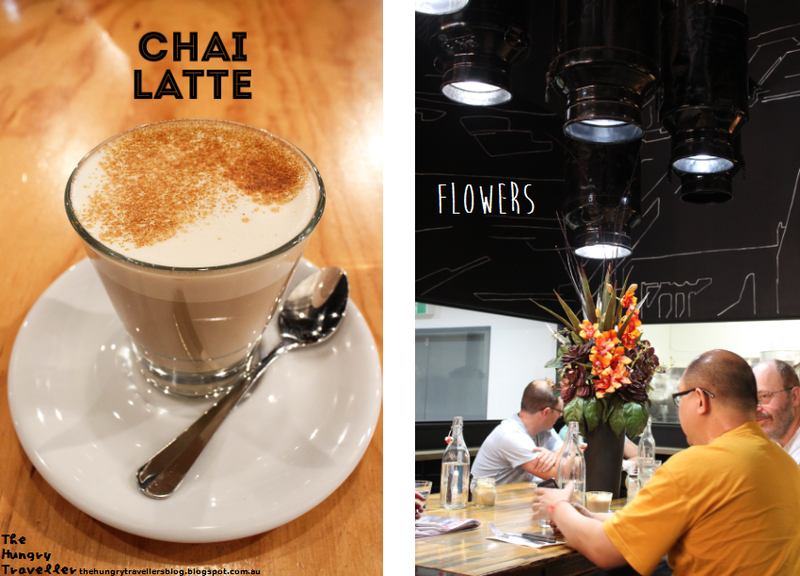 I'm not too fond of coffee in hot whether...but I did try a chai latte. It wasn't very sweet, but was very creamy which I liked. However, it wasn't very chai-flavoured and spicy either. Probably better to go with the coffee. 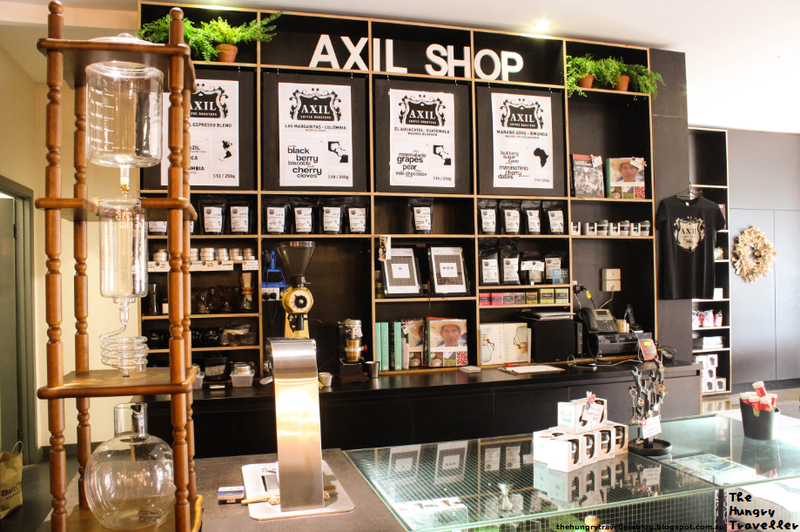 If you are really keen on the bean, Axil does have a lovely coffee store component which you can brouse on the way out. Is it worth visiting? If you're in the neighbourhood, Axil serves nice breakfasts and is preeetty spacious.